15/9- Marcy Quail may be on the verge of a winning streak in the Pandion Racing League, as she took the top spot in the Horizon division for the second race in a row. Not only did she win, she completely destroyed the competition. The colonial born pilot once again found herself going head to head with Perys Kerby during the weekend’s last race. The two pilots stayed neck and neck for the first half of the race, until Quail blew past him at the turn around. Despite Kerby’s admission that his defeat was a result of his own oversight, many other Horizon racers continue to accuse Quail of cheating. Some have even suggested that she and Kerby are romantically involved, and that Kerby took a dive. The Green Chopper refers to Quail’s aircraft, a souped-up first generation crop duster. The victory puts Quail in the position of the being the first Horizon racer to face a Legacy racer at the Oeil de Fleur race in two weeks. The event will be the first where the two divisions will finally go head to head. 7/5-It seems that even the loss of several key members of his proposed air racing league cannot keep Mathis Galland down. Construction on the first course broke ground in the countryside outside of Walsh early this week. Rumors of an anonymous benefactor began swirling shortly after those investors mentioned above stepped away. Galland confirmed it. The Walsh course is said to be a straight forward race course, but Galland promises future courses will be much more complex. Preliminary races will be held at the beginning of seventh month, and the season will continue on through Tenth Month. Tickets are expected to go on sale soon in Walsh, Toring, Yves, and the Crowndon Capital. 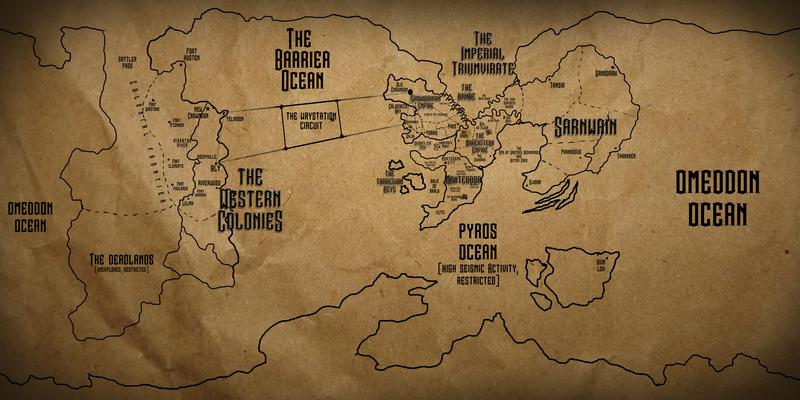 BONUS: Here, have an updated map of the world of Blackwood Empire. Like any creative endeavor, its a work in progress, subject to change. It’s also not to scale, because I’m not a cartographer and also I’m bad with numbers. Still, it should give readers a basic idea of where everything is. It’s also gigantic, so if you’re having a hard time reading it, click on it to get a better view.